The first hotel by Corbin and King, The Beaumont is a luxury Mayfair hotel with a stand out room, an inhabitable sculpture by Antony Gormley. 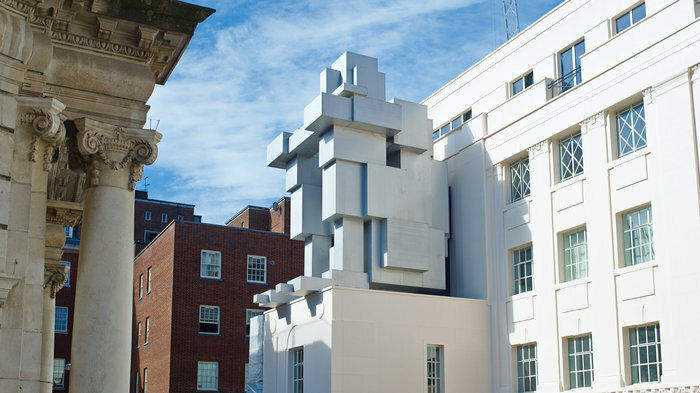 Corbin & King's Mayfair hotel with an inhabitable sculpture by Antony Gormley. Restaurateurs Jeremy King and Chris Corbin who have made their name with top notch eateries like The Wolseley, The Ivy and Le Caprice are behind this boutique hotel in the former Avis building, a 1920's Art Deco structure originally used as a garage. The Beaumont has 72 rooms and suites in understated greys and taupes but most extraordinary is room 215, an inhabitable sculpture of a crouching man by 'Angel of the North' artist Antony Gormley, a double bed floating in a dark oak-paneled room. The boutique hotel also includes a royal suite, the Colony Grill Room, a small private private dining room, The American Bar as well as The Cub Room - a residents-only bar - gym and a black-and-white-marble Hammam and spa. Classic dishes from both sides of the Atlantic. As you'd expect from Corbin and King, the duo behind Le Caprice, The Ivy, The Wolseley, The Delaunay - essentially a string of top London restaurants - The Colony Grill Room is a lesson in smart casual dining. The restaurant within The Beaumont, the restaurateurs' first hotel, takes its lead from the traditional grill rooms originally found in London and New York. The 100-seat restaurant set on two levels features an ornamental stained-glass roof light, blood-red leather banquettes, and 1930s bentwood and studded chairs. Alongside eggs benedict, omelettes, lobster and American sandwiches the a la carte menu includes plats du jour which vary depending on the day of the week, so you might get meatloaf on a Monday and Cornish fish stew on a Friday. Open seven days a week, from early for breakfast until late for supper, eating in The Colony Grill Room is "the dining equivalent of being driven, very sedately, in a vintage Bentley" (The Independent). The sort of place Hemingway would have felt at home. Like the rest of The Beaumont hotel it sits within, The American Bar is Art Deco in style - and what a style. It's the sort of place Hemingway would have felt at home with its leather-lined booths to sink into while sipping on a cocktail. The classic cocktail list includes French 75s and Kir Royals, The Beaumont (gin, dry sherry, elderflower, pineapple and lemon juices and sugar topped with champagne) and a fair few American whiskey cocktails. The bar menu boasts more than just peanuts and olives. Eggs benedict, omelettes, lobster and even cheesecake are on offer in the timber-panelled room filled with rather fabulous Art Deco furniture Jeremy King and his wife have been collecting over the years. Separated from The Colony Grill Room by a sheath of 1930's reeded glass, The American Bar is open to non-residents but if hotel guests want some privacy they have their own private Cub Room lounge and bar to retire to. From cheap budget places to stay to luxury 5 star hotels see our deals for hotels, including Cafe Royal Hotel from 48% off.